Learn the basics of using your Brigadier™ by Kyocera. Connect to a Bluetooth® device with your Brigadier™ by Kyocera. Make and receive calls on your Brigadier™ by Kyocera. Learn how to change the ringtone on your Brigadier by Kyocera smartphone. 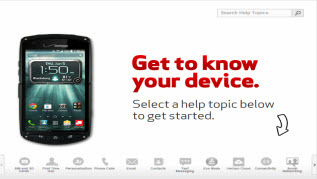 An interactive guide on how to place a call to a contact using your Brigadier by Kyocera. Learn how to use your Brigadier by Kyocera to call a new number. Take pictures and videos with your Brigadier™ by Kyocera. Learn how to take a picture using your Brigadier by Kyocera. Set up personal and corporate email on your Brigadier™ by Kyocera. A visual guide for replying to an email on your Brigadier by Kyocera. A step-by-step visual guide for sending an email using your Brigadier by Kyocera. Learn how to use Dura Widgets on your Brigadier™ by Kyocera. Use Dura Grid widgets for easy access with gloves on your Brigadier™ by Kyocera. Learn how to browse the web with Chrome on your Brigadier™ by Kyocera. An interactive guide for changing the language settings on your Brigadier by Kyocera. Manage the lock screen on your Brigadier™ by Kyocera. Use NFC to share easily between your Brigadier™ by Kyocera and other devices. For quick access to a function, use the programmable key on your Brigadier™ by Kyocera. Set up Wi-Fi on your Brigadier™ by Kyocera.